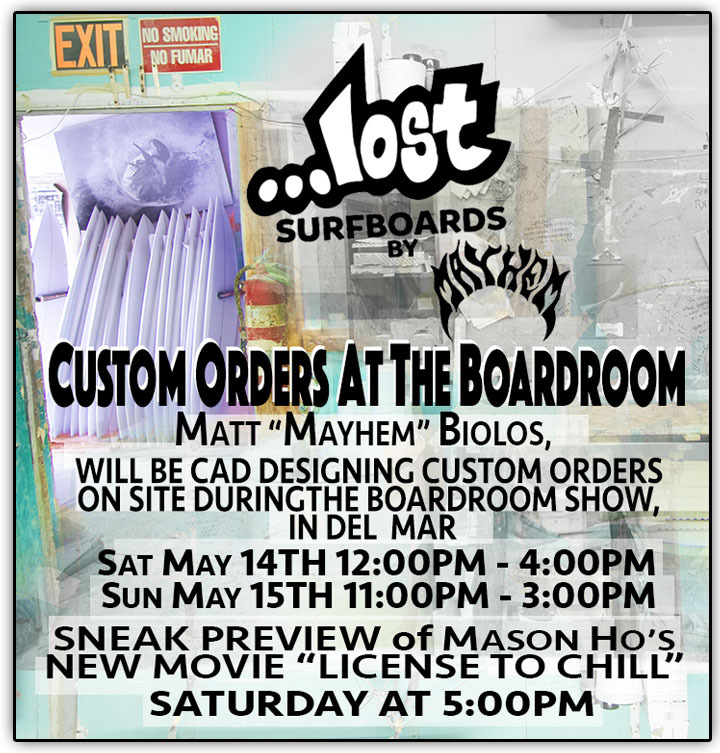 …Lost shaper/designer Matt “Mayhem” Biolos will be creating custom orders on site, during the Boardroom Show in Del Mar, San Diego. Sit down with Mayhem, one-on-one, in the …Lost booth and design your next custom board. Using the AKU shaper, 3D CAD program, you will start with any one of …Lost surfboard’s line-up of models and be able to tweak dims, outlines, rocker, rails, bottoms and volumes to create your dream machine. All custom boards will be $50.00 off retail and come with a free pair of …Lost boardshorts. Show up early to confirm and place your name on the appointment list. Space is or course limited. Also, don’t miss the sneak preview of Mason Ho and Cheeseburger’s new surf series “License To Chill” at 5Pm during the Boardroom Show on Saturday May 14th.